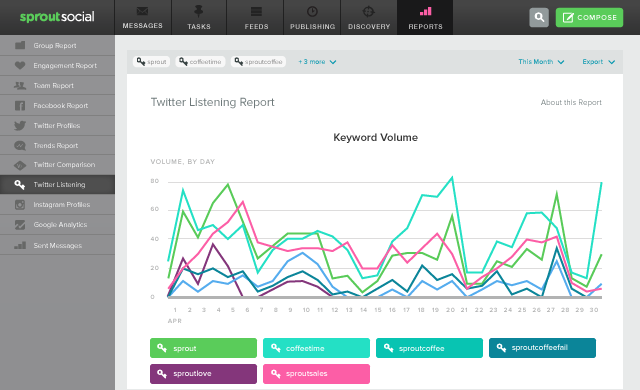 At Sprout Social, we are continuing to add to our suite of Twitter analytics tools—now with the all-new Twitter Listening Report. This report, available in Professional and Advanced plans, provides unprecedented and extensive access to powerful data so that you can track current and historical keyword usage across all of Twitter. Visualize the effectiveness of Twitter campaigns, past and present. Understand share of voice across brands, product lines or competitors. Uncover trends in the usage of brand relevant keywords and hashtags. To build your report, open the keyword picker menu, and click Add Keyword. The Add Keyword screen allows you to enter a keyword—such as a branded phrase, brand name or hashtag—using Twitter search operators, just like when you create Brand Keywords in the Smart Inbox. Adding multiple keywords enables you to compare and benchmark usage. It also lets you view share of volume. What’s more, the legends of the Keyword Volume and Share of Volume sections of the report are interactive, so you can add or remove keywords from the charts and tables without needing to rerun the report. The Stats by Keyword section digs in deeper, displaying powerful trend analysis on the per-keyword basis. This includes the keyword’s peak day of usage within the reporting timeframe and displays sample Tweets from that day. There are many ways to use the Twitter Keyword Report to gain insights that will help you make better business decisions. We’ve highlighted a few below that may be of particular value to agencies and brands. Whether you’re running a one-time, seasonal or annual campaign, a key piece of the puzzle is determining success. The Twitter Keyword Report analyzes Tweets and quantifies total volume, average volume per day and growth as well as a sampling of those Tweets and engagements. You can examine an individual campaign to see how much volume it generated or to determine growth over time, or multiple campaigns to see which ones resonated best with your target audience. 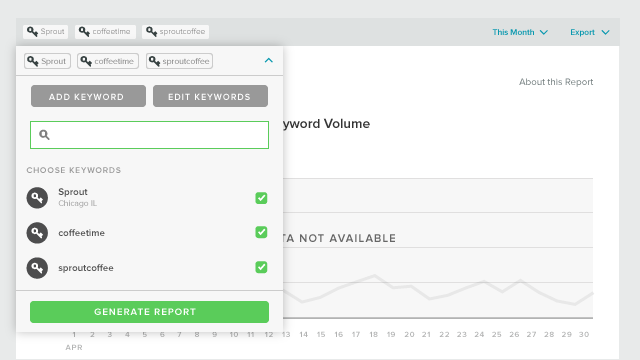 You can currently monitor keywords important to your brand in Sprout’s Smart Inbox; now, you can also report on those keywords. 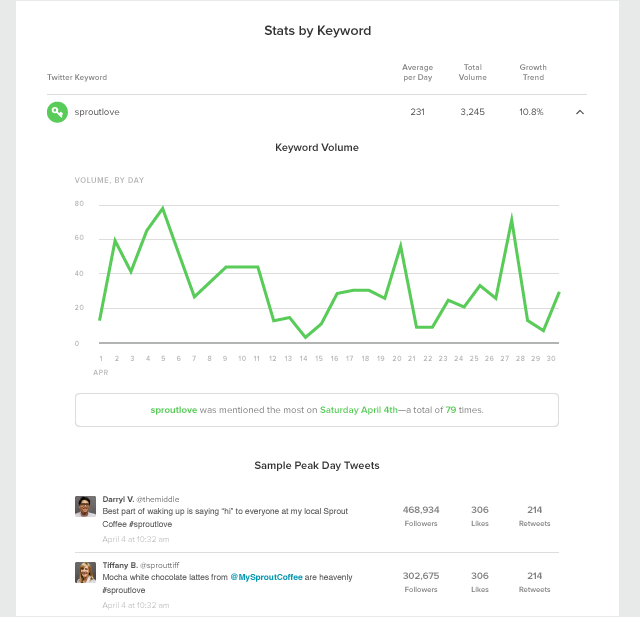 Simply add the same keyword, phrase or search operators to the Twitter Keyword Report to discover trends in usage. Use this information to correlate to significant events, important changes or even a PR crisis, and adjust your social engagement strategy accordingly. If you’re looking to launch a new product, determine how current products are comparing to newcomers or benchmarking your existing product lines, the Twitter Keyword Report provides insight to share of volume to determine your product’s place in the social market. 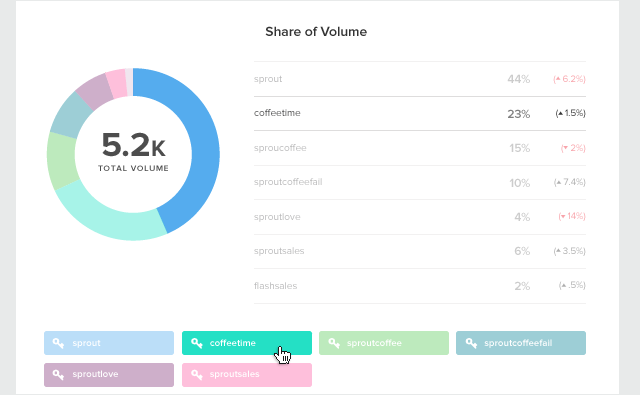 Sprout’s charts are interactive, so you can click on a keyword or graph to isolate and view the data with ease when comparing multiple keywords. A CPG brand comparing its seasonal promotions against a competitor’s to make informed strategy changes. Stay tuned for even more new and improved reports as we continue to enhance our reporting capabilities. And as always, let us know if you have any questions or feedback.